We would like to thank you for everything you have done for us in regards to the selling of our home in Lake Havasu City. When our home first went on the market things were very bleak and as time went on, we had to let our first agent go. She wasn't doing anything for us. It was frustrating working with someone who only thought of getting her house sold first. We felt lost and needed to find help fast. We looked long and hard for a new agent that would help us sell our home. We talked to many real estate agents over the phone. We were looking for answers to our questions. All we found were agents who thought they walked the walk and talked the talk. Some tried to give us an answer, they talked about the government, the way things were, but never really answered our questions. They talked in circles. We were looking for a real estate agent, not a politician. We wanted someone who would work for us and give us straight answers. We did our homework/research and talked to a real estate agent here in IL. She helped us locate you, Liz. She also did a lot of homework/research regarding the realtors in Lake Havasu City; she called us and gave us your name. She told us that you were the right person to get the job done and helped us get in contact with you. I must say that every time I call you, you are there ready to help us out with what ever question we may have and if we have to leave a message you return our calls. I remember the first time I called you, you were out of town, but you answered your phone. I was very impressed by that. You have been very helpful with getting our home sold. We are very please with the way you handled our situation. Since we no longer lived in the area it was very hard to locate someone that would be helpful, trust worthy, understanding to our needs and to be there when we needed you to be there. You were by our side all the way. Your personality shines through. You are very hard worker, and it shows in everything that you do. You are a go getter. That is what we needed. Thank you again for all of your time, hard work, and it was a pleasure doing business with you. You tell it like it is. You are truthful and dedicated to get the job done. That is what a real - real estate agent does. I would not hesitate at all, giving your name to others that are looking to sell their home. Wishing you the very best in all you do. Orchids to Liz Miller of Keller Williams Realty for selling my home in two days! We're forever grateful. I understand that there are a lot of people out there who are apprehensive about buying a home on the internet. I thought if we shared our experience it might help. Living in Hawaii and looking for a home in Lake Havasu we knew we would need a real estate agent that we could trust and that we could work with long distance. 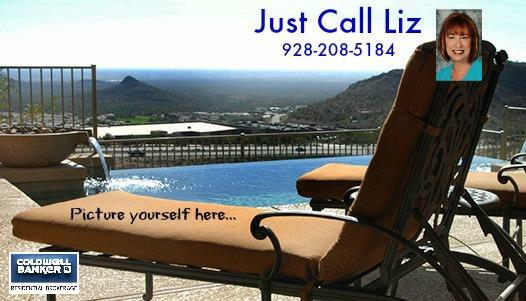 After looking through Real Estate Magazines we had picked up on our last trip to Lake Havasu we looked at all the ads from the different Realtors and decided to "Just Call Liz". Best move we ever made. We sent an e-mail to Liz asking her to call and she did, within about 10 minutes! We spent a little time talking to her, telling her what we were looking for in a house and kicking around some ideas with her and she promised to get back to us with some homes to look at. By the next day she had found us four houses to look at and e-mailed us pictures and info on all of them. One of these was our perfect house at the perfect price and we made an offer. Everything was handled by phone, fax and e-mails. There were a few glitches along the way, I think there always are when purchasing a home, but Liz handled everything for us and kept everything moving along smoothly. We went to Lake Havasu to sign the closing papers which wasn't really necessary but we were anxious to see our house and meet Liz in person. I guess the best thing about dealing with Liz is that she listens to what you want and need, doesn't assume she knows better than you do and has been in the business long enough to know a lot of contractors, lenders, service people, etc. so is able to help with whatever you might need. Internet shopping for a new home can be fun and a little scary. Working with the right Realtor can make all the difference. My advice to anyone contemplating an internet home purchase? Just call Liz. Our first friend in Lake Havasu! I cannot even begin to “Thank You” for all that you have done to make this move such an easy transition. You have gone way beyond what most realtors would ever have done to make sure everything was perfect for me. I will be recommending you to anyone that mentions that they are in need of help either buying or selling a property. From my initial call to you looking for some information about the housing market right up to the final walk through I Ifelt as though I was the only client that you had. I know that is not the case, but that is how you made me feel. Thank you again Liz for helping me with this move. Liz was amazing! We found her by accident during one of our many times of looking for homes on the Internet. She contacted us within minutes of entering our information in to the web site. We were hesitant about finding an agent this way, but we were extremely tired of spending hours trying to find the perfect home while living in another state. The other problem was my husband would not be available to help find or purchase our new home. I flew to Havasu only two times. The first time was just to look and get a feel for the area. Liz was right on target with her home selections. The next trip the first house was the perfect house! Sold! She helped me during the stress of the offer and counter offers, she worked with our mortgage person, inspectors, appraisers and all through the escrow process. She was always available. Thanks to Liz our home is perfect and so was our experience. I recently chose Liz Miller to sell my home in Lake Havasu City. She was attentive to detail, always available, and kept my best interest as a seller in her perspective of real estate. From the initial meeting, to the closing, she was always the consummate professional. Liz was incredible, and I believe, the driving force that sold my home as quickly as it did in an economy that certainly had room for improvement. Joel and I just wish to express our appreciation for all the help you provided to us while we were searching for just the right house here in Lake Havasu. When we first came down to look at this area, we were unsure if this was the right place for us to purchase a second home. Having never been to Lake Havasu we didn't know anything about the area, but thought we might like it here. You didn't push us, but showed us the area and showed us a few houses to start. That was the right way for us to become comfortable with your approach and experience. Then you just sent us new homes to view via email and responded to our calls and gave us your unbiased opinions of the houses we selected. Your professional knowledge and gentle guidance were deeply appreciated. You didn't just show us houses to look at, you were able to seek out what exactly our needs were and what we liked. Through that insight you helped us find a perfect home. We also want to thank you for assisting us throughout the process and being a great advocate for the purchase. You watched out for our protection to be sure we didn't have problems when the final closing came and that everything was in working order and jumped on any problems you saw. You have always conducted yourself in a professional manner, but more importantly, you were so personable and friendly. Since we are from Salt Lake City, we didn't have any friends or family to assist us when we wanted to start furnishing the house. You went above and beyond as our realtor by offering to let us have items delivered to your home for us to pick up when we came back to Lake Havasu. Even when the sale completed and your work was done, you still maintained a commitment to us and were are responsive to our calls and questions. You also introduced us to the perfect mortgage broker. Dan from Bank of America was also a great help to us. Although there was a small glitch in the closing, he worked extremely hard to make it happen on our timeline. We have purchased many homes in the 30+ years we have been married and we found this experience to be the most pleasant one. We would be more than willing to provide a reference to anyone looking for a home in this area. Please just ask and we will do it. Thank you again for your help and assistance. After 3 months of emailing and speaking long distance, and 1 week of hustling, you were able to complete our needs for a new home. It was a whirlwind, and a couple of bumps in the road, but you overcame them, and were able to find us our little piece of paradise, right where we wanted to be, in Lake Havasu . You definitely were on a mission, not to let us come back to the windy city, broken hearted, and without any property. You definitely worked hard, and met all our needs. Glad it worked out for us all, you are a great realtor!!! Thanks again, for all your effort. 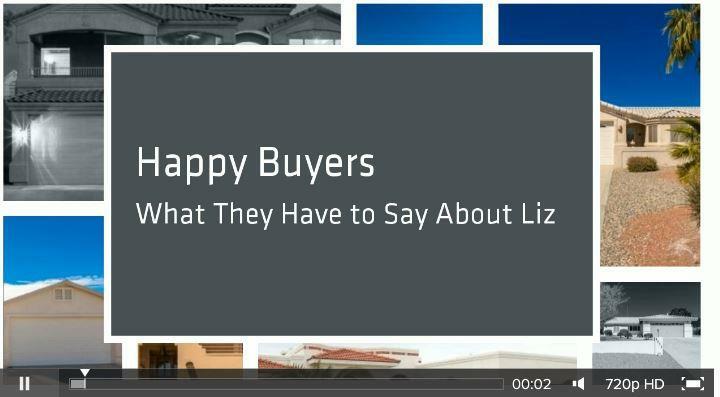 Happy Selling with Liz Miller. Liz Miller's knowledge and understanding of the power of the internet, and her ability to communicate with her fellow real estate agents are what set her apart from all the rest. Liz marketed and SOLD our home in one of the most challenging real estate markets in recent history. If your looking for a true sales professional instead of a tour guide then Liz is your gal. Thanks Liz!